Colombo, December 1 (newsin.asia): The 14-member Tamil National Alliance (TNA) group in the Sri Lankan parliament, which is playing a pivotal role in the on-going constitutional imbroglio, has told President Maithripala Sirisena that it will not support any move by the United National Party (UNP) to impeach him. 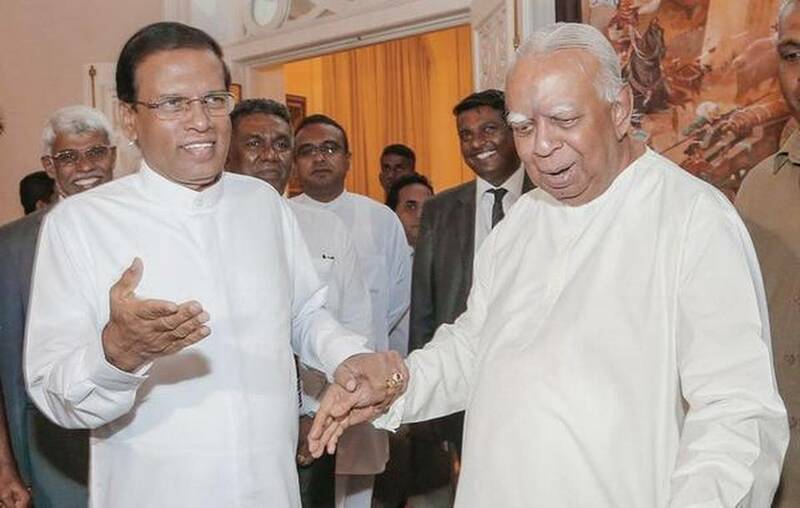 A prominent TNA MP told newsin.asia that in the meeting the TNA had with President Sirisena on Friday, the President acknowledged that some of his actions may have been unconstitutional and said that he is ready to make amends. The TNA MPs in turn assured him that the TNA will not support any bid by any party to impeach him, provided he rescinds those acts which are patently unconstitutional. There is a campaign in pro-democracy circles sympathetic to the UNP, to get parliament to impeach the President for the crisis he had landed Sri Lanka in. The unconstitutional actions which the TNA wanted rescinded are: the dissolution of parliament on November 9 when Prime Minister Ranil Wickremesinghe of the United National Front (UNF) had majority support in it; and the summary dismissal of Wickremesinghe and the arbitrary appointment Mahinda Rajapaksa as Prime Minister on October 26. The TNA MP told newsin.asia that an impeachment motion cannot be envisaged by the UNP now, given the present composition of parliament. An impeachment motion will have to be carried by two thirds majority (150 out of 225), the TNA MP said. And to get this the UNP will have to get the support of the TNA, the Janatha Vimukthi Peramuna (JVP) and others from other parties. At present the UNP, by itself, does not even have a simple majority of 113, he pointed out. Therefore an impeachment of President Sirisena is ruled out. Sources close to the President said that there is a distinct possibility of his withdrawing the gazette dissolving parliament. According to Mano Ganeshan, former cabinet minister and leader of the Tamil Progressive Alliance (TPA), who met Sirisena on Friday, the President said that he would withdraw the gazette. But the President is still insistent that he cannot appoint Wickremesinghe as Prime Minister because he simply cannot get along with him. The ideological and inter-personal rift is unbridgeable. He made this clear at his meeting with the United National Front (UNF) MPs on Friday. He also made a strong pitch for the candidature of the UNP’s Deputy Leader Sajith Premadasa, with whom, he feels, he will get along. Sajith had been approached by Sirisena’s emissaries at least ten times before but fruitlessly. He did not want to be the cause of a split in the UNP.Further he did not want to be Prime Minister of a government which has only a year and a half left. Therefore, while the present parliament is likely to continue in existence, the Premiership is still a bone of contention between the President and the UNF. The TNA had told the President that he should accept Wickremesinghe because Wickremesinghe still has the full support of the UNF. Moreover, it was the UNF under Wickremesighe ,which had made him President of Sri Lanka in January 2015. The President is to continue to discuss this issue with the UNF on Sunday. It is reported that the President has already met Wickremesinghe in this regard. Meanwhile, signals coming from Prime Minister Mahinda Rajapaksa’s party, the Sri Lanka Podujana Peramuna (SLPP), indicate that it will not take kindly to any move to re-appoint Wickremesinghe as Prime Minister. Although Rajapaksa himself has said that he is ready to quit and that he recognizes the President’s constitutional right to sack him, his government’s spokesman Keheliya Rambukwella said that appointing Wickremesinghe will mean that the President is appointing a man, who in his own words, is “the most corrupt” in the country, complicit in what he described as the “Central Bank robbery”. The replacement of Rajapaksa by Wickremesinghe will put a strain on the relationship between the President’s Sri Lanka Freedom Party (SLFP) and Rajapaksa’s SLPP though Rajapaksa has said that the alliance will continue even if he is sacked.